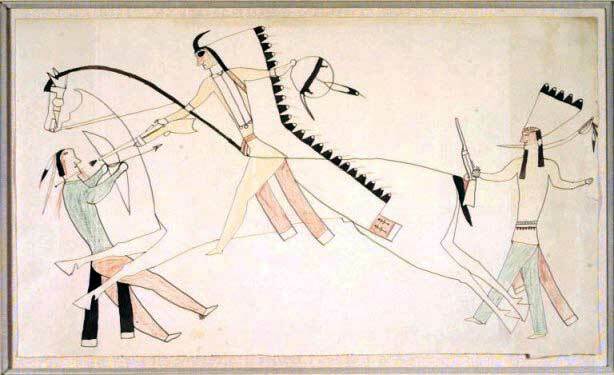 Native American Ledger Art consisted of book drawings were the result of paper being introduced to the Native American Indians by the Europeans. Ledger books, originally used by Mercantile Trading Companies to keep their accounts, were given to Native Indians artists who produced Ledger Book art and drawings that illustrated examples of Native American artwork. Ledger books contained an easily accessible form of paper. Traditionally, picture drawings, pictograms, paintings and art symbols were crafted on the hides of animals, on tepees and clothing. The traditional form of painting on buffalo hide gave way to works on paper, muslin and canvas which are collectively referred to as Ledger Art. Native American Ledger art therefore flourished primarily from the 1860's to the 1920's. Many of the American Indians were fine artists and had inherited a tradition of conveying meanings and stories by using pictures and symbols.